Something I have been wanting to do on this site is explore the roots of some of the Louisiana dishes that are now so well known. I love to explore the evolution of cooking styles, regional cuisines, and regional dishes, in this case Jambalaya. 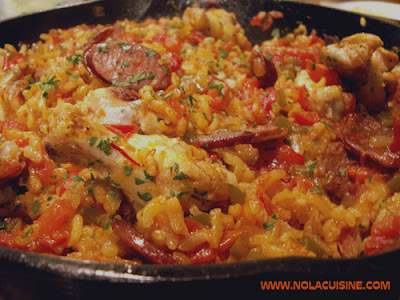 It is hard to deny that Jambalaya has roots in the Spanish Paella, which was probably introduced sometime during the four decades in which Spain held possession of Louisiana during the late Eighteenth century. The key to making this Paella is good quality short grain rice, real Saffron, and good homemade chicken stock. I also used Spanish Chorizo which is a cured pork sausage made with garlic and paprika. I have a really good Spanish Chorizo recipe which I will share here in the very near future. In a Paella pan or large cast-iron skillet as I used, over medium-high heat, heat the olive oil until almost smoking, brown the seasoned chicken on all sides until golden brown. Remove to a plate. Reduce the heat to medium and add the onions, bell pepper, and Chorizo. Saute until the onions are translucent, about 7-10 minutes. Add the garlic, cook for 1 minute more. Add the tomatoes, roasted red peppers, and saffron, cook for 8 minutes more, stirring often. Add the rice and stir in. Cook the mixture until the rice is pearly opaque and has absorbed some of the liquid that has collected from the vegetables. Add the white wine and cook for about 5 minutes, stirring occasionally. Add the stock, season it to taste with salt and black pepper, arrange the chicken pieces around the pan, submerging. Bring to a boil then place in the preheated oven, uncovered for about 15-20 minutes. When the rice is still a bit crunchy, remove the pan from the oven and cover with aluminum foil and let stand for about 10-15 minutes to finish cooking. Sprinkle with the parsley. Serve immediately. Wipe your Red Peppers with Extra Virgin Olive Oil. Place in a pan and put into the oven for about 45 minutes, turn once. Remove from the oven to a new dish, cover with plastic wrap for about 15 minutes, this will help the skin pull away from the flesh. Remove all of the skin and seeds. Cool. My resource for Spanish Cuisine has always been the books of Penelope Casas, in particular, The Foods and Wines of Spain by Peneolpe Casas. I agree with you 100% on the origins of Paella. One reason is in Mexican cooking there is a dish called Fideo. In my cookbook I make the comment it is a take-off from Paella. WHEN I MOVED, I BROKE THE TREASURED BOTTLE OF SAFFRON MY GRAND-UNCLE HAD LONG AGO BROUGHT ME FROM SPAIN. AS FOR FIDEO, I ONLY HAD THE POOR MAN’S VERSION, ANGEL HAIR LIKE PASTA IN … TOMATO SAUCE…. I am always amazed that Paella is cooked uncovered while all my other rice dishes are cooked covered (steamed). I was taught you should not even lift the lid during the entire cooking time. You even use less liquid: 2 1/2 c liquid to 1 1/2 cup rice vs the 2 to 1 for steamed rice.